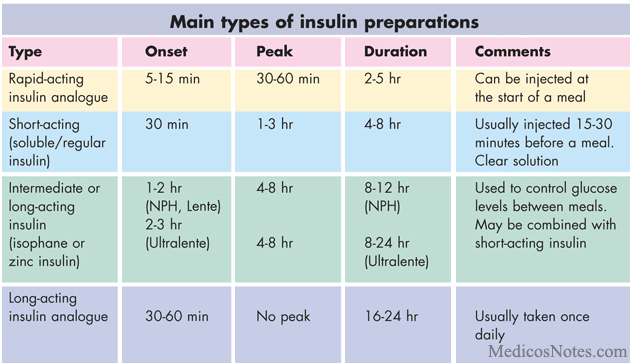 What are different Insulin preparations? Various insulin preparations are available based on onset and duration of action.They can be short acting or long acting. 28th lysine & 29th proline in B chain is reversed by recombinant DNA technology. It has less tendency to form local aggregates. Lispro has less incidence of hypoglycemia. Absorption is delayed with NPH insulin, but not with ultralente. Injected just before or after food. This is the shortest acting group of insulin. This can be protaminated to extend the duration of action. Aspart + protaminated aspart = Biphasic insulin. Can be used as 30/70 insulin. Asparagine @ B23 position is replaced by Lysine, lysine at B29 replaced by Glutamic acid. Biphasic isophane available as pen devices. (Mixtard 30 novolet). Most popular in 30/70 combination. Can be used once daily. Ultara lente not available now. Asparagine at 21 replaced by Glycine. 2 Arginine residues added to c terminus of B chain. No peak in action,smooth sustained effect. Not stable at room temp. Myristic acid is bound to B29 lysine. No local aggregate is formed. Can be mixed with other insulins.